Missouri’s Attorney General confirms there are active human trafficking investigations in the Show-Me State. 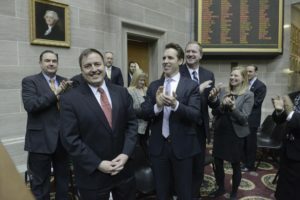 Attorney General Josh Hawley (R), spoke to Missourinet last Wednesday to reflect on his first year in office. The interview covered numerous subjects, ranging from human trafficking to Sunshine Law issues to the case involving the former Mississippi County Sheriff. The interview was recorded before St. Louis television station KMOV reported its story about Governor Eric Greitens. Hawley describes human trafficking as a “scourge” that touches every corner of Missouri. He spearheaded the July raid of Springfield massage parlors that were allegedly connected to human trafficking. “You know our raid back this past summer, we served 18 warrants across southwest Missouri. It involved over 70 law enforcement officers, and we shut down 13 separate businesses that were acting as fronts for human trafficking,” Hawley says. Hawley tells Missourinet it was the largest anti-trafficking raid in Missouri history. Hawley confirms there are “active” human trafficking investigations in other parts of Missouri. Missouri’s Attorney General also says an investigation is underway into the Governor’s office reported use of the Confide app. Missourinet asked Hawley about the issue, during the ten-minute interview. He confirms they have pending Sunshine law inquiries right now into Governor Greitens’ (R) office and State Auditor Nicole Galloway’s (D) office. Governor Greitens’ spokesman, Parker Briden, told the “Kansas City Star” Thursday that the governor’s office has been working closely with Attorney General Hawley’s staff to provide information relating to their inquiry. Hawley also expects a jury trial to begin soon for the former Mississippi County Sheriff in southeast Missouri who’s charged with seven counts of forgery. Hawley successfully worked to oust Sheriff Cory Hutcheson in May, after the criminal charges were filed and after an inmate died in the Mississippi County Jail in Charleston. Hawley tells Missourinet he’s working with federal prosecutors regarding the May death of inmate Tory Sanders. Hawley has said that Sanders died after an altercation that Hutcheson was directly involved in, and that the death happened after Hutcheson’s license as sheriff had already been suspended. ** He says his lawsuit is proceeding against Purdue Pharma, Endo Health Solutions and Janssen Pharmaceuticals. He filed a lawsuit against the companies in 2017, alleging they carried out a “multi-year” campaign and deliberately misrepresented the addictive risks of opioids. He says the three companies also misinformed physicians and consumers. Hawley says about 1,000 Missouri deaths in 2016 were linked to opioids. ** Hawley says he wants to know what Google is doing with consumer information. Hawley launched an investigation in 2017 into whether Google has violated Missouri’s Merchandising Practices Act. ** Hawley notes his office has worked to civilly commit ten sexually violent predators in 2017. He notes civil commitment is a complex process, but an important one. He says children are our most vulnerable. Some of those civilly committed in 2017 had molested children and toddlers.